Cosy two bedroom apartment for rent in the centre of Prague next to National Theatre. The apartment is spacious, tastefully furnished and fully equipped, and offer comfortable accommodation in an excellent location. At the top floor apartment you can enjoy a nice terrace with view to National Theatre. With fully fitted kitchen and large bedrooms you can really wonderful Prague. 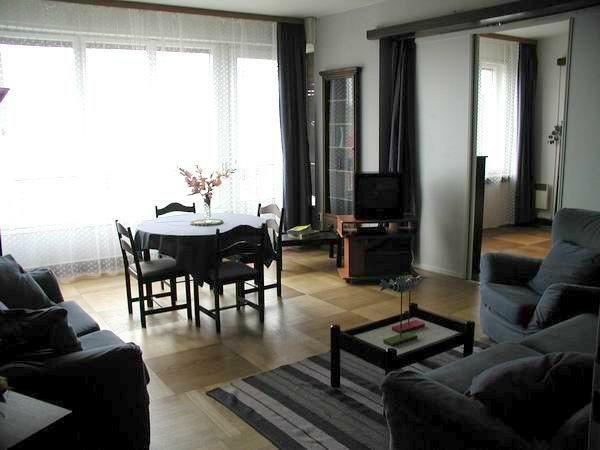 This Prague apartment rental is suitable for long term rent as well as for holiday rentals. In addition, location of this apartment rental is outstanding. Only 10 minutes of walk to Old Town Square and Charles Bridge. In the neighbourhood are many shops, bars and restaurants. Furthermore, Tesco store in walk distance too. Our group of three stayed in the only 2 bed apartment in the National Theatre apartments in Prague for one week in January 2010. The apartment was spacious, clean and comfortable in a great location right in the city centre with Narodni street (the local shopping street with a handy Tesco store) just around the corner. We booked through Prague-city-apartments and their office is only a 5 minute walk away, is open 24 hours and has very helpful, friendly staff. The building is well secured on a quiet side street and has a lift to all floors. Our apartment was on the top floor with 2 lovely balconies, a large one to the front and a smaller one to the back, with views over the rooftops and directly onto the National Theatre. The accommodation was snug and warm, well equipped with all mod cons and a plentiful supply of hot water. Beds were clean and comfortable, and the bathrooms were immaculate with plenty of towels and basic toiletries supplied. There are a good selection of local cafes, restaurants and bars on the nearby streets, including a late night convenience store just around the corner. I recommend a slightly longer 5 minute walk to the Cafe Louvre on Narodni for an unparalleled culinary experience, breakfast, lunch or dinner. The whole smorgasbord of the Old Town is just a short stroll away, you need not worry about transport at all while you stay here, the whole of Prague city centre is very compact and right on your doorstep. These apartments represent excellent value for money and I would have no hesitation in recommending them to any visitors to lovely Praha city. My family and I stayed in the National Theater Apartments during a 2-day trip to Prague. We booked a 2 bedroom apartment and it was plently big for 4 adults and two children. The apartment was clean and the furnishings sufficient. Certainly not fancy by any means, but definitely good enough for what we needed. We paid about 110 Euros per night which is an excellent rate for the six of us. The location is good as well. About a 10 minute walk to Charles Bridge, 15 minutes to Old Town Square and 2 minutes to a major tram stop that goes up to the Prague Castle. There is also a metro stop about 5 minutes from the apartment. There are restaurants nearby and a place that sells breakfast right outside the door. I have no reservations about recommending this apartment to others.